Each approved submission will receive 2 BNB. The top contributor will be rewarded a 10 BNB bonus. The top 2-5 Contributors will be rewarded a 5 BNB bonus each. BNB Bounty will be distributed within three weeks upon the completion of this program. 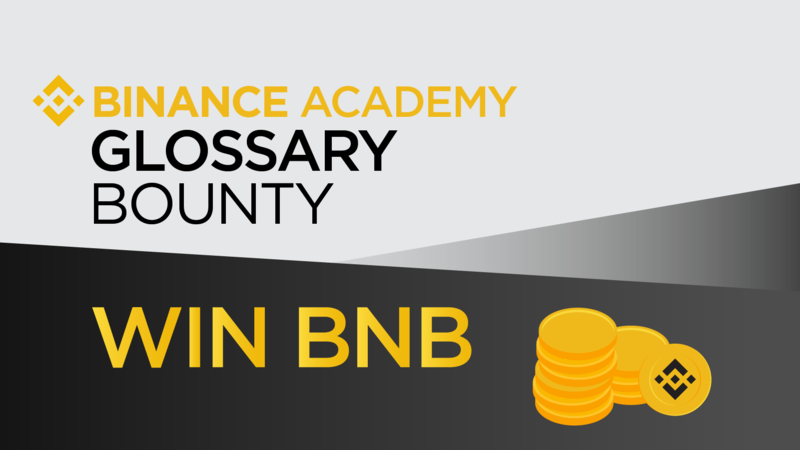 Visit the Binance Academy Submission Guidelines page and familiarize yourself with the requirements. Approved submissions will be based on a first-come-first-served model. Each submission will be timestamped upon submitting and will be reviewed in order of submission. Once a term has been approved, it is no longer eligible for submission. For a regularly updated list join the Binance Academy Chat on Telegram or bookmark this google sheet, which will be updated automatically. Glossary submissions must range between 200-500 words (title and sources not included). Note: for the bounty, the minimum word count has been reduced to 200. Plagiarism and work that is not your own will be immediately disqualified. Include your name within the submission. - 1-2 sentence explanation (definition). - A more in-depth description of the term in the remainder of the body. Include a list of sources both within the text and at the bottom of your submission so we can verify the information.